I am so excited. These are huge physical accomplishments for Anya!!! Anya: (comes into kitchen holding a stack of play food) I made a sandwich! Me: Wow! What kind of sandwich? Anya: It’s a vegetable sandwich. Me: Oh? What’s in it? Anya: (examining her sandwich) Lettuce! And…pizza and bacon. 11-week-old Sierra rolled from her belly to her back for the first time tonight! Now both of my little princesses are sound asleep up in their beds. It’s the first time we really put Sierra to sleep instead of keeping her downstairs with us until we went to bed. I’m about to go to bed, myself. We had a good day. Here’s hoping we have a good night! Anya: Daddy, do you want some pizza? Lex: Yes! Mmm, this is delicious! Anya: You want some more? Lex: Yes! Do I really put in my mouth? Anya (cont’d): Do you want some hammer cheese? Lex: Hahahaha, yes, I would love some hammer cheese. Anya: Do you want a drink, Daddy? Lex: Yes, yes I do! I’m so thirsty. What is this? Anya: It’s yog– it’s… it’s… it’s… it’s… (HUGE GRIN) V8! 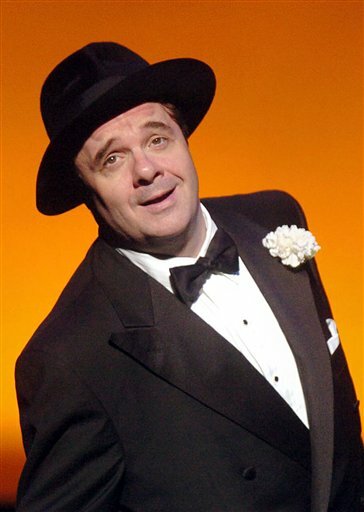 …sometimes I think Sierra bears a small resemblance to Nathan Lane. Can you see it? It probably shouldn’t surprise me anymore, but I have big girls! I realized Thursday that I needed to raise the straps on Sierra’s car seat to the second slot already (and that I probably should have done it a few weeks ago). She’s not the hugest baby ever, but she definitely looks big for her age. She’s very long. When she’s wrapped up in her SwaddleMe, she stretches the leg pouch as far as it can go. Courtesy of her recent growth spurt, Miss Anya has suddenly found herself able to reach things off counters and table tops – areas that were previously safe havens for things we didn’t want her to have. Yesterday afternoon Lex and I marveled at how Anya’s head was significantly higher than Lex’s desk. When did that happen? It seems like we just bought the foam guards to keep her banging her forehead on the corners.